By Mark Renz, Chris Bloomingdale, and Tony Summers, University of Wisconsin, Madison. The knotweed complex, including Japanese knotweed (Fallopia japonica) and related species/hybrids, are perennial, invasive plants that are problematic in natural areas, urban environments, and rights-of-way throughout much of the United States and southern Canada (Figure 1). Plants in this complex are difficult to control, thus it is important for managers to select the appropriate herbicide, application rate, and timing to maximize control. Studies conducted by the University of Wisconsin measured Bohemian knotweed (Fallopia x bohemicum)* control under various treatment scenarios. These included 1) herbicide selection, rate and application timing, 2) spray volume, 3) mowing prior to herbicide application, and 4) feasibility and cost of knotweed eradication. FIG 1. 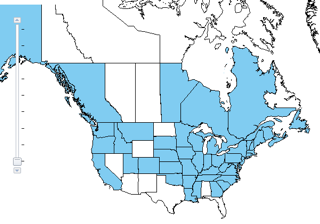 Distribution of Japanese knotweed in North America (USDA, NRCS). Herbicide efficacy field trials were established on sites with more than 85 percent cover of Bohemian knotweed. Plots were arranged in a randomized complete block design with four replications. Plot size was 10 by 25 feet. Herbicides and rates included in efficacy trials are shown in Table 1. Data collected included Bohemian knotweed cover 12 and 18 months after application. 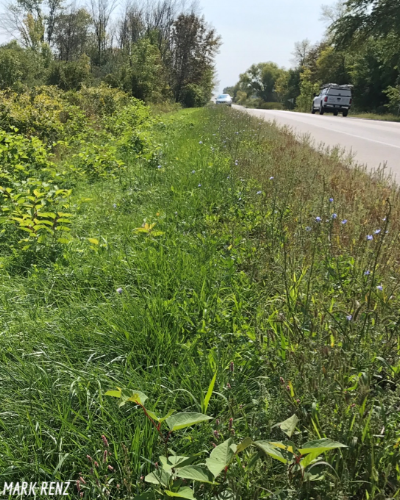 The relative cost and feasibility of Bohemian knotweed eradication were measured at eight roadside infestations. Infestations were mowed in July, and Milestone® specialty herbicide at 14 fl oz/A was applied to regrowth as a spot treatment for three consecutive years. Knotweed cover and cost of mowing followed by herbicide application were measured annually for three years. Table 1. Herbicides and application rates evaluated for Bohemian knotweed control in Wisconsin field trials. The most effective herbicides for controlling Bohemian knotweed were Milestone® and Capstone® specialty herbicides, Rodeo®, and imazapyr. 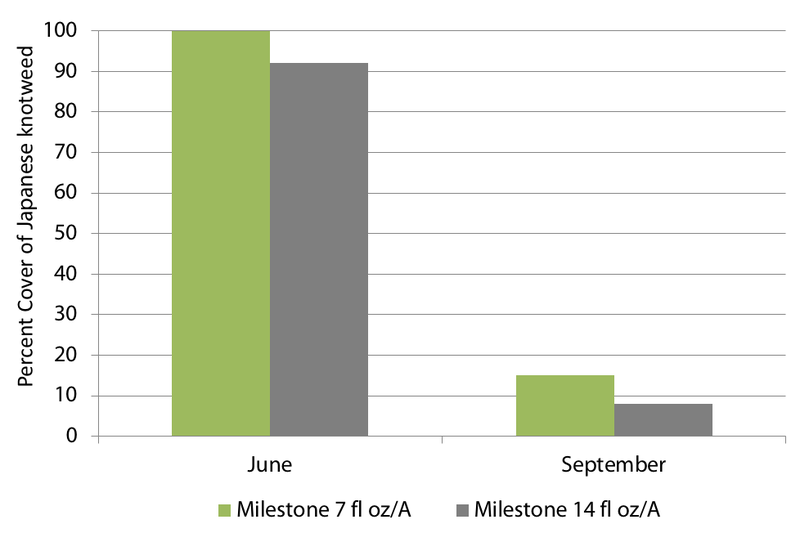 Milestone at the spot treatment rate of 14 fluid ounces per acre (fl oz/A) was most effective when applied in September (92 percent control) compared to June, 12 months after application (MAA) (Figure 2). Control declined significantly by 18 MAA. Milestone at 14 fl oz/A provided more consistent control than the 7 fl oz/A rate. Spray volume did not affect Bohemian knotweed control with fall-applied Milestone at 14 fl oz/A (Figure 3). Mowing Bohemian knotweed the summer prior to a fall Milestone application did not significantly improve control compared to sprayed, unmowed plots. FIG 2. Bohemian knotweed cover 1 year after application with Milestone specialty herbicide at 7 or 14 fl oz/A, applied in either June or September. FIG 3. Bohemian knotweed cover 10 months after application (MAA) of Milestone specialty herbicide at 14 fl oz/A, applied at four spray volumes (GPA=gallons per acre). Imazapyr and Rodeo are non-selective herbicides (control both grasses and broadleaf plants), resulting in bare ground following application. Rodeo applied as a 9 percent solution in September provided similar knotweed control as Milestone. Imazapyr applied in summer or fall to resprouting stems that were previously mowed, provided the greatest Bohemian knotweed control (88 percent) at 18 MAA. The long soil residual properties of imazapyr may delay restoration for at least one year following application. Maintaining or restoring desirable vegetation on infested sites will reduce the potential for knotweed reinvasion. 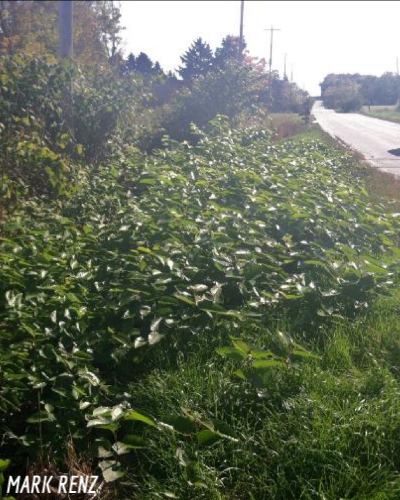 Data from the three-year Bohemian knotweed eradication effort were averaged over eight roadside infestations. Initial cover of Bohemian knotweed was 63 percent across plots, and all sites had perennial grass understory. Results showed that Bohemian knotweed infestations were not eradicated after a three-year treatment program; however, knotweed cover was reduced by more than 80 percent two years after application, and density declined to less than 0.6 stems per square meter. 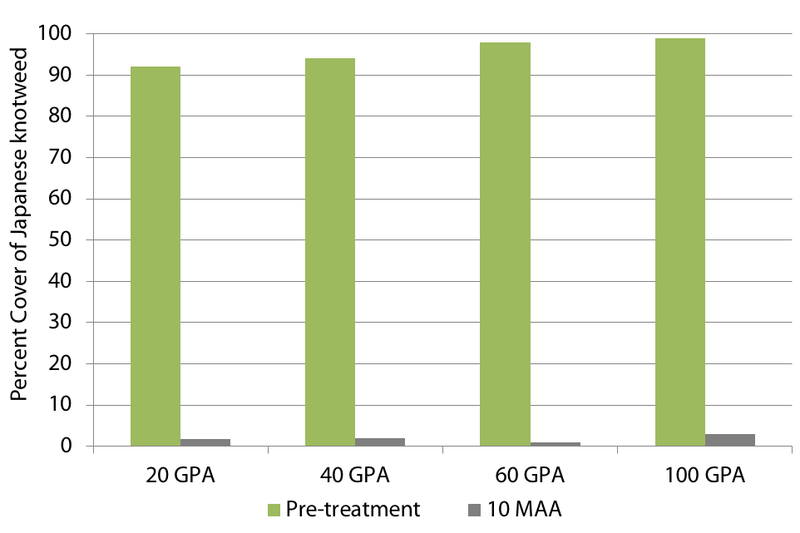 Average treatment cost per acre decreased over time as knotweed density declined (Table 2). Costs highlight the importance of early detection and treatment to stop continued knotweed spread. Table 2. Average percent cover of Bohemian knotweed and cost per acre of the eradication program. The average cost per acre was based on staff time to mow (year 1), and apply Milestone® specialty herbicide at 14 fl oz/A to regrowth with a backpack sprayer. Costs will vary based on application method. FIG 4. Change in Bohemian knotweed density over a three-year period with annual spot-application of Milestone® specialty herbicide at 14 fl oz/A. (A) Pre-application; (B) Second-year application; (C) Third-year application. These results suggest that Bohemian knotweed and related species/hybrids can be controlled with herbicides, but infestations will require monitoring and retreatment for more than three years to obtain eradication. Land managers need to allocate sufficient time and resources to eradicate small infestations of Bohemian knotweed. The majority of treatment cost will occur in the first year. 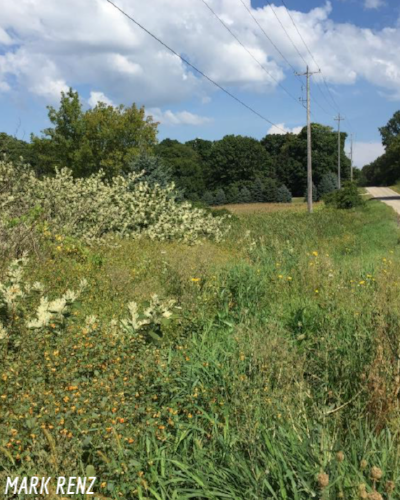 Site-specific factors, including desirable understory vegetation, need to be considered in selecting an appropriate herbicide prior to conducting management. USDA, NRCS. 2018. The PLANTS Database (http://plants.usda.gov, 18 June 2018). National Plant Data Team, Greensboro, NC 27401-4901 USA. *Authors did not conduct genetic tests on knotweed populations; however, based on morphological characteristics of plants, they believe all studies were conducted on Bohemian knotweed. Milestone and Capstone specialty herbicides are not registered for sale or use in all states. Contact your state pesticide regulatory agency to determine if a product is registered for sale or use in your state. When treating areas in and around roadside or utility rights-of-way that are or will be grazed, hayed or planted to forage, important label precautions apply regarding harvesting hay from treated sites, using manure from animals grazing on treated areas or rotating the treated area to sensitive crops. Consult the label before purchase or use for full details. Always read and follow label directions.